There are so many craft projects for kids to do now. I remember when my kids were little they didn’t have the ideas then that they do now. The kids had very little to work with then but now there are so many crafts that they can play with. The craft foam is so versatile that they can make many different kinds of crafts. This crafts for kids is for making their own door hangers. Kids love to be able to say this is my room. 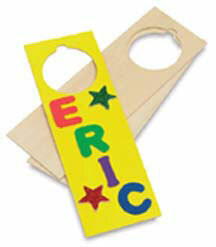 With these door hangers they can put any kind of decoration on them to make them personal. They can even say “Keep Out” or “No Boys Allowed”. Kids can come up with many different sayings. They can pick their favorite colors for the hanger or they can even match the color of their room. 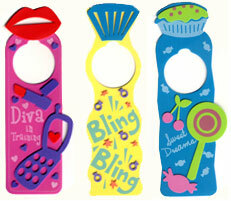 Craft foam or pre-cut door hangers. Silk flowers or any kind of decal that would work. The door hangers pictured here are made from pre-cut foam. The decals that are on them were cut from different colored craft foam. Craft foam is very easy to work with and cuts very nice. Just let them cut out the objects that they want on their hanger. They can also write whatever they want on the hanger with the felt pens. Use darker colored pens because they show up the best. Glue the objects on to the hanger with craft glue. I found that tacky glue works the best for kids. Let dry completely and then they can hang them on their door. Girls like to put the silk flowers on their door hangers. They can get as fancy as they want. Boys like more manly objects like sports items. There are many different crafts projects for kids and I will be adding more all the time.